Try this twist on the classic Italian gnocchi dish. The goat cheese and the spring onions bring in a great taste and your vegetarian guests will love it. Peel and diced the potatoes then cook until soft, drain and return to pan to dry out for a couple of minutes then mash and allow to cool. Once cooled mix in the flour, seasoning and eggs then kneed to form a dough. Cut into four and roll out into a sausage shape and cut into "little pillows". Place onto a tray dusted with flour and chill until needed. Remove the skin from the goats cheese then blend with the MEADOWLAND Double until smooth then season to taste. Mix the water and KNORR Tomato & BasilSauce together and bring to the boil until thickened. 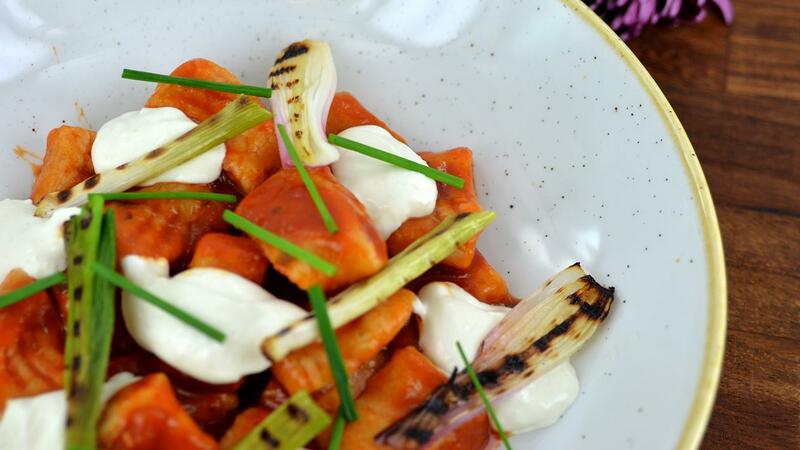 Rub the spring onions with oil and char grill, cook the gnocchi and reheat the sauce. Drain the gnocchi and coat in the sauce, add the basil then place into serving bowl, spoon over the goats cheese mousse and charred spring onions.